Wonderful as home decoration and a brilliant hostess gift. Delightful handmade ceramic chicken figurines. 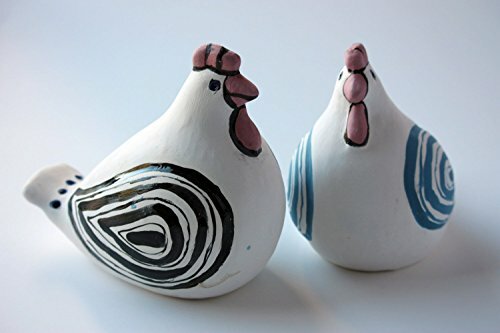 These cute clay chicken sculptures are individually hand painted with lots of love. Let your cheerful character shine through with some chicken decor. Add a touch of humor to your home by treating yourself or giving as a unique housewarming gift to the fun-loving hostess. Every piece is made by hand, because of this your product is guaranteed to be unique. There may be slight imperfections or variations, but that's all a part of the charm of handcrafted art. Whether you're treating yourself to a new art piece or searing for a gift for friends and family, you're guaranteed to find something to fall in love with at LaKuritza pottery and ceramic wares. If you have any questions about this product by LaKuritza, contact us by completing and submitting the form below. If you are looking for a specif part number, please include it with your message.